I LOVE the Simon Says Stamp January 2018 card kit. It is perfect for Valentine’s Day cards. The mix of sentiment in the kit can also work for a variety of people which is very nice. This is the second card I made using the kit. Extra Details: I began this card by die cutting one of the patterned papers with a cross stitched rectangle die. I adhered the paper to a white card base. I die cut a smaller scalloped rectangle form the mint card stock. I stamped a sentiment in black ink on it. 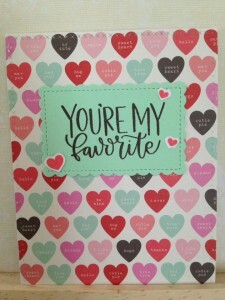 I stamped the small hearts on a scrap of white cardstock with Lawn Fawn’s Guava ink and fussy cut them out. I added the hearts to the mint rectangle. I then adhered the mint rectangle to the card base with foam tape. 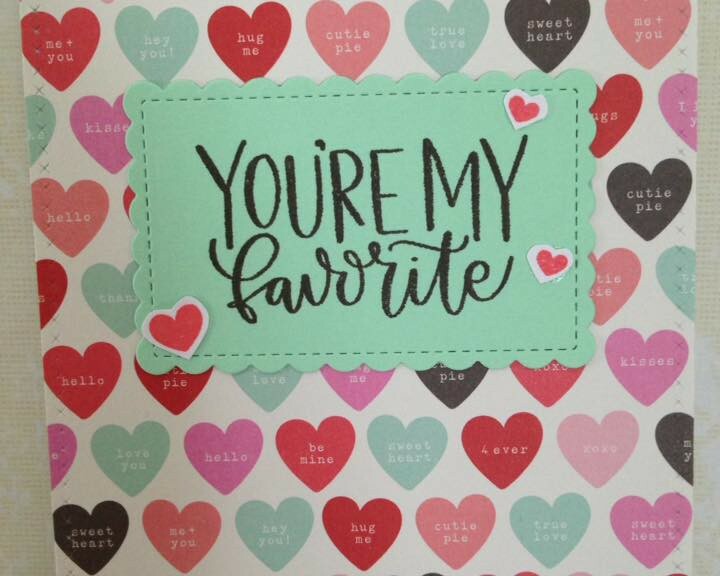 Love your candy hearts background – thanks for playing along with us at the Simon Says Stamp Wednesday challenge! Thanks! I really do love this card kit.